In this post, I wanted to round up all of my Winter faves that are needed to keep you looking cute, but comfy as the new season is approaching. All of the pieces featured in this post will be linked at the end of this post if you are interested in a certain piece. Happy Winter! 1. LEGGINGS: Everyone needs a good pair of leggings, I believe! Leggings are always my go to when I’m on to the go or styling a sweater and riding boots! Plus, a good pair of leggings can last you a long time! 2. VESTS: I. Love. Vests! Vests add so much to a simple top or they can jazz up a sporty outfit as well! I personally have the vest featured in the collage above and I love it!! 3. 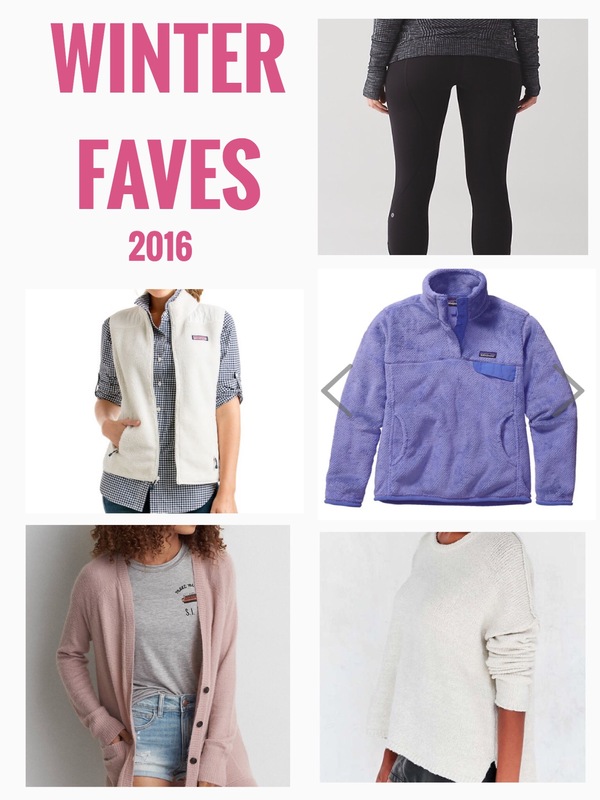 PATAGONIA PULLOVERS: Patagonia pullovers and half zips made a big splash into my school last winter and I feel like they are still so popular in my school for the fall and winter time! They are so comfy and add a little bit more to a simple t shirt and tennis shoes. 4. CARDIGANS: Layering is what fall and winter is all about. I love my cardigans because I can add them to flannels, simple tops, or even t shirts! 5. SWEATERS: I recently went on a sweater spree when I went shopping for Thanksgiving, because I’ve been sweater obsessed lately! In Dallas it doesn’t get very cold, so sweaters are just enough to keep my warm (Check out my Thanksgiving Haul here). Hope you enjoyed my round up of my Winter Faves! See y’all soon.